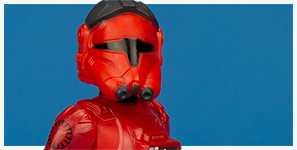 This update to the Resistance branded Star Wars Universe section of our Hasbro photo archive reminds us of another red-clad bad guy pilot with a Hasbro-made action figure. His ride may not be as cool as the Cobra Rattler, but we dig the Major Vonreg 3.75-inch action figure nonetheless! Click the link above to have a closer look at this cool figure!